Powered by the Northwest Earth Institute since 2009, EcoChallenge is an online educational platform that challenges you to take action on environmental and social issues that matter to you. Common wisdom says it takes at least three weeks to change a habit: if you can stick with new behavior for 21 days in a row, we believe you’re a lot more likely to keep it up forever. Throughout the event, EcoChallengers share their progress and reflect in the social feed, earn points for taking action, and watch the impact they make add up in realtime! Learn more about our free public events, as well as how organizations, schools, and municipalities are using custom EcoChallenges to engage their communities and make impact. How do I register for EcoChallenge? 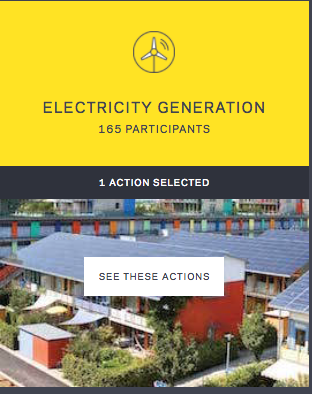 If it’s your first EcoChallenge, simply click the JOIN button on the event homepage. After creating your profile, you’ll have the option to search for a team, create a new one, or join the Community team. I have participated in the past and am having trouble registering for this challenge. How do I register as a repeat participant? I’m having trouble logging in. How should I troubleshoot? If you’ve participated in past EcoChallenge events, be sure to review #3 in this FAQ. If you’ve successfully registered for the event, and are having trouble, first make sure you’re using the correct email address to log in. If you’re using the correct email address and are unable to gain access, next try resetting your password. If after following those steps you’re still unable to login, please contact EcoChallenge Support. 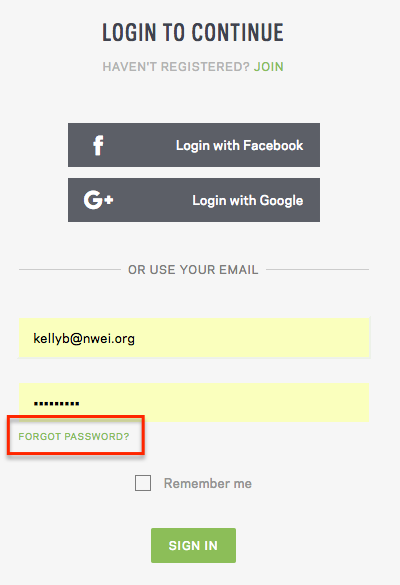 On the login page, simply click FORGOT PASSWORD?, and EcoChallenge will send reset instructions to the email address you provided at registration. EcoChallenge has already started - is it too late to sign up? Registration remains open until the end date of the challenge. While people can register on the last day we recommended registering at least a week before the start of the challenge so that you can explore actions, build your team, and connect with other participants on the feed. Registering early will give you the most success in designing your challenge. No. Participants are free to change teams as often as desired, but can only reside on one team at a time. Can I change teams after I sign up? Yes! If you wish to change teams, simply navigate to the team you wish to join, and click JOIN THIS TEAM. After confirming the change, you’ll be redirected to your new team’s page. Please note that while you won’t lose the points you’ve accumulated thus far, the points you earned on your previous team will remain with that team. Any new points you earn will be added to your new team. Can I be a team captain for multiple teams? No. Participants can only participate on one team at a time, so captaining multiple teams isn’t possible. When I change teams, do I have to do anything else to leave the old team? No. When you change teams, you’re automatically removed from the previous team. EcoChallenge won’t let me join a new team. If you are the only captain of a team, and there are other people on your team, you’ll need to promote a new captain before you are able to join a different team. Can there be multiple team captains for the same team? Yes! Current team captains can promote others by invitation. To do so, first click VIEW TEAMMATES on your team page, and then click INVITE AS CAPTAIN. There is a maximum of three team captains allowed per team. In addition to earning points for daily and one-time actions, you can also boost your score by adding a profile picture, creating a team, inviting others, and through other event-related activities. For a detailed list of activities and point values, please consult the Points page in your event’s About pages. A note about points: the EcoChallenge reward system is unique - regardless of which event you’re participating in, you’ll always earn points for checking in, even if it’s to indicate that you aren’t able to complete any actions. Changing behaviors can be difficult, and we believe that any and all participation is productive and deserving. Also, when marking daily actions complete, note that you'll only receive two point awards on any single day: points for the first daily action completed, and points for completiing one or more additional daily actions. FOR EXAMPLE: if Kelly completes one daily action on Monday, she'll earn 10 points. If she completes one more daily action, she'll receive 10 more points. If she completes 5 daily actions, she'll still only earn 20 total points for daily actions on that day - 10 for the first completed action, and 10 more for completing any number of additional daily actions. Please note that, if applicable, impact will still be calculated and reported for each daily action. Finally, none of these rules apply to one-time actions; you can earn points on a per action basis for one-time actions. What’s one of the best ways to increase our collective action? EcoChallenge provides many resources to engage and motivate your community. If you’re a team captain, take a moment to review our Team Captains tips or participate in a Team Captain webinar. If you’re spreading the word in your organization, be sure to make use of our free media kit that provides Social sharing tips, as well as downloadable graphics, posters, and other assets to bolster your efforts! These can all be found on the Resources page in your event’s About pages. How often should I “check in” during EcoChallenge? Simply put, as often as you can! Watching your impact add up each day, as well as sharing your experience with others on the social feed can provide important inspiration if you start to lose steam. Can I check in retroactively? All of our public events allow users to check in retroactively for a specified number of days. The length of the retroactive check-in window is set at the event level and may differ between other private events. For check-in questions related to your event, please contact your event administrator or EcoChallenge Support. How do I select challenge actions? First, from your Dashboard, click EDIT MY ACTIONS. Next, click on SEE THESE ACTIONS. Is there a limit to the number of actions I can take on? The maximum number of actions participants can select is set at the event level, and may vary between events. Contact your organization’s event administrator or EcoChallenge Support if you have questions about action limits in your event. 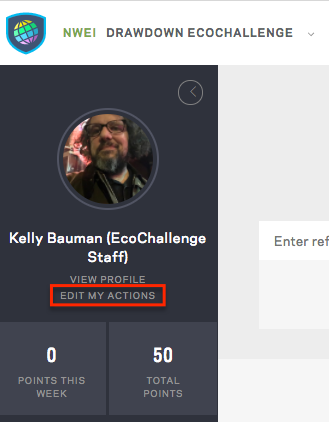 Can I add more actions during EcoChallenge? You may add and edit actions as long as the event is open. However, keep in mind that adding a daily action with very little time left in the event may not have the same behavioral effect as adopting it early on. What’s the best way to be successful with my EcoChallenge? Make sure you plan ahead to be prepared to meet your goals. Setting realistic goals (i.e. selecting a realistic number of actions), and sharing your experience with others through the social feed are great ways to stay engaged and motivated. Also, be sure to check out the team and event impact pages to see how your efforts are contributing to significant collective impact. Finally, it's okay if you do not meet your own expectations – there’s no such thing as a “perfect” score in the event. EcoChallenge is provided to help you learn about and change behaviors you’re interested in – not to judge the quality of your efforts. Have fun! Team captains can invite other team captains to participate in friendly team competitions. To do so, go to the Teams page from your Dashboard. There you’ll find a list of teams with a Challenge link in the right column. If you do not see the Challenge option, you may not be a captain of your team. Once you select Challenge, you’ll have the option to add a custom message to the email sent to the other team’s captains. Teams always have the option to decline or cancel competitions as well – even after they’ve started. At the end of the event, EcoChallenge will send competition results to both teams. Can I “check in” and log my progress at any time during the EcoChallenge event period? Yes. EcoChallenge is open 24/7! Will I get notifications when anyone in my team posts to the Feed? You won’t receive notification every time someone posts to the feed, but you’ll receive email notification when someone comments on your social feed posts.